There has been talk that understanding number place values can uncover treasure hidden within the dark crevices of the Zapzapmath jungle. The story goes that an old archaeologist by the name of Sir Winston Division has hidden a huge pile of shiny gold coins in a cave. He left the coins there to challenge any to conquer his obstacle course and prove himself worthy of the treasure. Upon hearing about this hidden treasure, the explorer in you emerges. You change into your explorer ensemble, grab your caving tools, and head into the Amazon jungle in the pursuit of a good challenge. Finding the cave was easy; reaching the goal was a much harder task than you initially imagined! To get to the treasure, you need to complete a puzzle of steps. Each step has a multiplication or division figure imprinted on it, and you have to surmise which combination of steps will get you the right total based on the amount given on the panel. 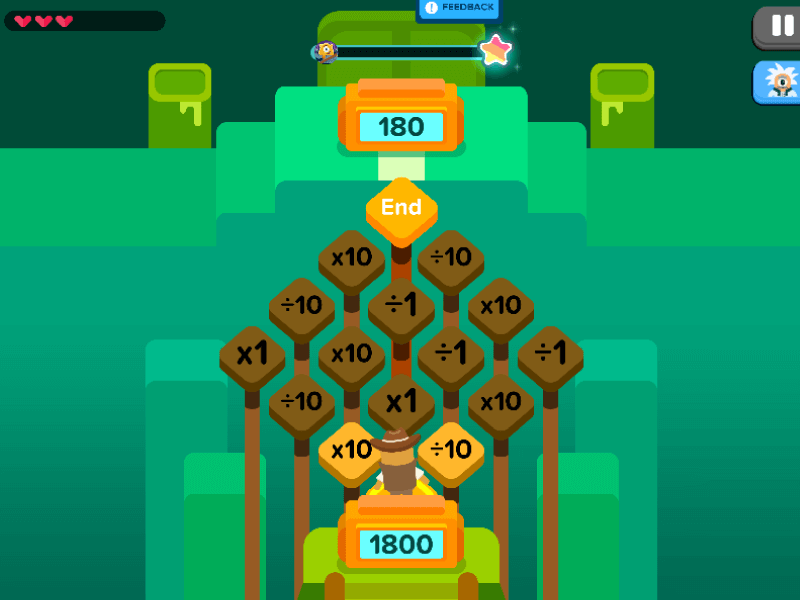 Tap on your step choices to multiply or divide the starting total. Proceed with the next step by tapping on your next choice. Keep doing this until you get to the end. If you make a mistake along the way, tap the highlighted steps to cancel and move back a step or two. When you reach the end, you will find out if your calculations have scored you a shiny pile of gold coins! The correct answer will reward you with the coins falling out from its secure spot, whereas the wrong answer will have you, well, falling from your secure spot! Amazon Jones is a fantastic adventure game that engages you in the challenge of conquering multiplications and divisions within a combination of steps. By merging two important operations in mathematics, this adrenaline pumping gameplay will stimulate a high sense of achievement upon completion of the mission, as well as motivate your mind to expand your critical thinking skills. A vital lesson in this game is the study and comprehension of whole number place values. Whole number place values represent the value of the position of a digit in a number. Each place has a value of 10 times the place to its right. Understanding whole number place values helps keep track of greater numbers and allows for the simplifying of the form and function of numbers as a whole so that operations such as multiplication and division can be completed with ease. It is important to understand and use mathematical sentences, relating both multiplication and division procedures to create a more complex and creative concept of the two. Practising the operations separately is a good start, but in order to solve a problem that includes multiple operations, players must practice to acknowledge the intent of the problem, not just each number and operation on its own. Which is why Amazon Jones is an ideal start to applying several operations in one great gameplay. Big steps await you, Amazon Jones!